Last Friday while in Manhattan visiting family over Spring Break, I had the opportunity to view the documentary about the world’s first street style photographer, Bill Cunningham. The film is a touching portrait of an insular man who practices his craft as a way of life and tells the story of Bill and his lifelong love of fashion. It’s an emotional ride, and I teared up more than a couple times. Bill is a lovely human being and a true legend. It took ten years to produce this film – eight of which were spent trying to convince Bill to allow the producers to film him. He doesn’t see himself as a celebrity – far from it. He’s just a man “who seeks beauty in the world.” Bill is perhaps the most upstanding, honest, and ethical journalist to ever walk the earth. He cares so deeply, and is so passionate, about his work that there seems to be no division between his personal and professional lives. If there’s one thing this film will do, it will drive you to become a better person. Inclusiveness defines Bill Cunningham’s life. After all, isn’t that what the streets are all about – the public? Street style is not about keeping people out, it’s about bringing people in. The movie paints a picture of a man whose true passion is in democracy. In fashion there’s enough of the private list events at swanky boutiques. Bill was the progenitor of a fashion craft that celebrates everyone – black, white, gay, straight, rich, poor – it’s all fair game to a street style photographer. I think that the exploding popularity of street style is because the public is responding to a form of fashion that is nearly diametrically opposed to the glossy images of models wearing largely unattainable designer clothing, in a culture controlled by an aristocratic few. Street style is the opposite of that – it’s about the myriad ways in which everyday people choose to express themselves, not about excluding people. Everyone has the opportunity to be featured in Bill’s On The Street column in the Sunday New York Times, as long as they catch his eye! That quote defined the film and defines Bill’s life. As the ultimate egalitarian, Bill photographs the fashion that interests him, regardless of who is inside the clothing. “I don’t see people – I see clothes,” he says. At one point in the movie, he passes up on the opportunity to photograph Catherine Deneuve because “she wasn’t wearing anything interesting.” He doesn’t “care about celebrities and their free dresses.” His zest for life and his passion for his craft is invigorating to watch. In another scene, friends discuss how Bill was crushed the time Women’s Wear Daily used his street style photos to put people down. 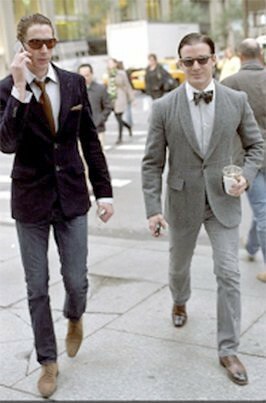 His WWD editors had used his street style pictures to compare real people to models, with an accompanying article making fun of the non-models. Bill resigned from his position at WWD in protest. Bill loves everyone he photographs so deeply that one of his friends said he never got over that betrayal by his editors at WWD. Bill’s belief that to take a street style photograph of someone to humiliate them is atrocious and nothing short of criminal. Street style is about spreading positive energy. Although Bill also covers the high society parties in addition to street style for the New York Times, he stands apart from the festivities. Or as he says in the movie, he aims to be “invisible.” Bill loves the downtrodden and the marginalized, and in one scene he tells a dolled-up transvestite that he has been fighting to get him into the Times, but that his editors won’t let him run “a man in a dress.” But Bill insists that one day they will! EDIT: What is perhaps most interesting about this film, and I forgot to include before publishing, is that Bill views himself as a photo-journalist first and foremost. He is, as he puts it, “listening to the street.” All of Bill’s photos are candids for that reason, because he is capturing life as it happens. Most of his subjects don’t even realize they’re being photographed unless it’s head on or he uses a flash. It’s extremely difficult to practice the kind of street style that Bill does because it’s very easy to miss the shot. But when you get the shot the photo can look extraordinary in a way that no posed image simply can. Look at my candid photo of Iman, for example, which is one of my very few. Bill is only interested in capturing what is really happening on the street. One subject in the film calls him an “anthropologist” for his purist method of documenting fashion trends as they occur. Not a single photograph of Bill’s has ever been artificially produced or set-up, which is part of what makes him such a legendary street style photographer. The outpouring of excitement and enthusiasm for Bill Cunningham and his documentary is nothing short of extraordinary. I received so many emails and messages asking about this movie that I chose to write more in depth about my reaction to the film. Bill Cunningham New York opens in Chicago on May 20th – I hope to see all of you there! You can also join the public Facebook event I created and invite your friends. He has interesting take on New York's fashionable people.